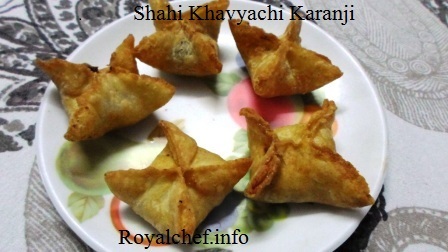 This is a Recipe for preparing at home Khari Bites with White Sauce. This uncommon snack makes the use of the popular Indian Khari biscuits to create this rare and unique starters dish, which is suitable for any kind of party, including cocktail or kitty parties. In a Kadhai add the Butter, Onion, Garlic, Green Chilies and fry for two minutes and then add the Capsicum. 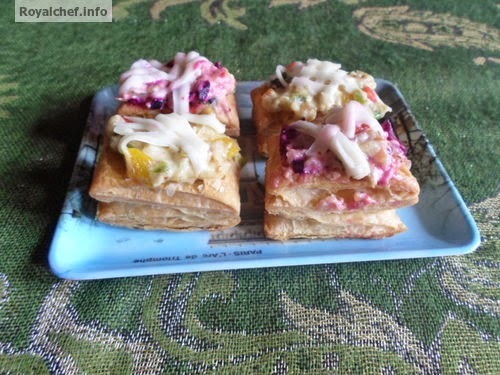 Mix it well and cook for two-three minutes on a slow flame and add the White Sauce, Boiled Beetroot and mix it well and keep a table spoon of the mixture over the Khari, garnish with the Cheese, Tomato Sauce and Black Pepper. Heat a non-stick pan and apply the Oil over the pan and arrange the Khari over the pan, cover with a plate and roast for two-three minutes on a slow flame.